Both of them had an affection for Naomi, and therefore set out with her upon her return to the land of Judah. But the hour of test came; Naomi most unselfishly set before each of them the trials which awaited them, and bade them if they cared for ease and comfort to return to their Moabitish friends. 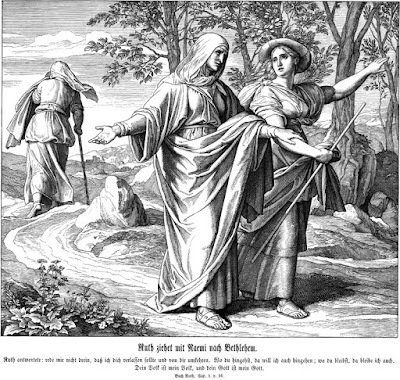 At first both of them declared that they would cast in their lot with the Lord’s people; but upon still further consideration Orpah with much grief and a respectful kiss left her mother in law, and her people, and her God, and went back to her idolatrous friends, while Ruth with all her heart gave herself up to the God of her mother in law. It is one thing to love the ways of the Lord when all is fair, and quite another to cleave to them under all discouragements and difficulties. The kiss of outward profession is very cheap and easy, but the practical cleaving to the Lord, which must show itself in holy decision for truth and holiness, is not so small a matter. How stands the case with us, is our heart fixed upon Jesus, is the sacrifice bound with cords to the horns of the altar? Have we counted the cost, and are we solemnly ready to suffer all worldly loss for the Master’s sake? The after gain will be an abundant recompense, for Egypt’s treasures are not to be compared with the glory to be revealed. Orpah is heard of no more; in glorious ease and idolatrous pleasure her life melts into the gloom of death; but Ruth lives in history and in heaven, for grace has placed her in the noble line whence sprung the King of kings. Blessed among women shall those be who for Christ’s sake can renounce all; but forgotten and worse than forgotten shall those be who in the hour of temptation do violence to conscience and turn back unto the world. O that this morning we may not be content with the form of devotion, which may be no better than Orpah’s kiss, but may the Holy Spirit work in us a cleaving of our whole heart to our Lord Jesus.